LAHORE: Members of the new Punjab cabinet took oath of their office at Governor House on Monday evening. 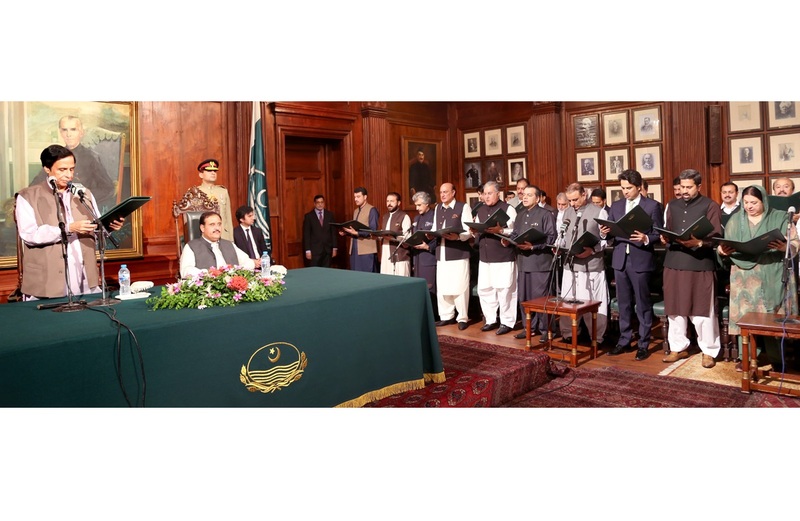 Acting Punjab Governor Chaudhry Parvez Elahi administered oath to the new cabinet members while Chief Minister Sardar Usman Buzdar and other prominent personalities attended the ceremony. On Sunday, Pakistan Tehreek-e-Insaf (PTI) government had announced a 23-member cabinet for Punjab. The nominations had drawn the ire of several people as the cabinet only has one woman minister and no representation of minorities. The provincial cabinet includes Mian Mahmoodur Rashid as minister for housing and urban development; Yasmeen Rashid as minister for health; Samiullah Chaudhry as food minister; Mohsin Leghari for the post of irrigation minister; Makhdoom Hashim Bakht as a finance minister; and Fayyaz ul Hasan Chohan as a minister for information and culture. Aleem Khan, the PTI’s senior leader who is currently under the radar of National Accountability Bureau (NAB) in graft cases pertaining to offshore company and assets beyond means, has been named as the minister for local government and community development as well as a senior minister. He has appeared before the NAB in this regard as well. Hafiz Mumtaz Ahmed (Excise and Taxation and Narcotics Control), Hafiz Amar Yasir, Yasir Humayun Sarfraz (Higher Education) and Mian Aslam (Punjab Industries, Commerce and Investment) and Murad Raas (School Education) have also been named in the cabinet. Others who got the portfolios are Taimoor Khan (Youth and Sports), Raja Rashid Hafeez (Revenue), Anser Majeed Niazi (Labour and Human Resource) and Raja Basharat (Law and Parliamentary Affairs). The ministers who have not yet been assigned portfolios include Muhammad Sibtain Khan, Sardar Asif Nakai, Hafiz Ammar Yassir, Malik Nouman Langrial, Hasnain Dareshak, Malik Muhammad Anwar, Chaudhry Zaheerud Din and Hashim Dogar. Muhammad Akram Chaudhry has been named as the political advisor. It merits mention that the cabinet members had been named after Prime Minister Imran Khan had interviewed as many as 30 lawmakers for various positions in the Punjab cabinet.